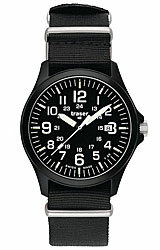 The Traser Red Combat, Model 104148 with a Rubber Dive Strap, features Traser's toughest features as part of the P6600 series of watches. The Red Combat features a black calendar, day-date, robust double case construction, bidirectional rotating black PVD-plated steel bezel, sapphire crystal, 200 Meters water resistance and full tritium illumination. 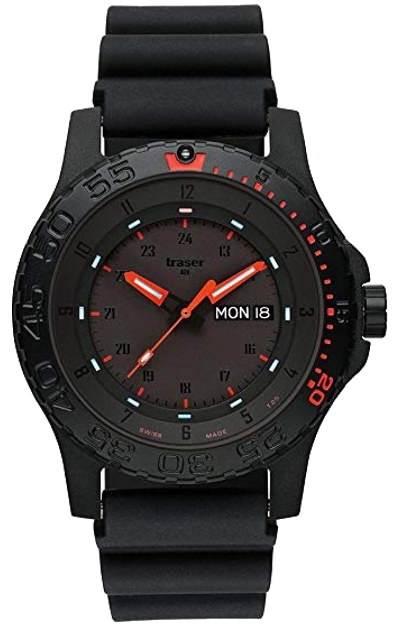 TopFlight Watches is an AUTHORIZED Traser Watch Dealer selling only brand new, direct from the factory, Swiss Made Traser Tritium watches made to the exacting US Military MIL-W-46374 F specifications. We do NOT EVER sell offshore or so-called Gray-Market watches. Your watch will be brand new, fully boxed and factory fresh! Plus, you can be absolutely certain your Traser 2 Year Limited Warranty will be honored by TopFlight Watches and by authorized dealers anywhere in the world.